Italian-born artist, sculptor, and modern furniture designer. Opening his own metal workshop in 1939 he taught jewelry design and metal work. Later, as the war effort made metal a rare and very expensive commodity he began to focus his efforts on jewelry making, even designing and creating wedding rings for Charles and Ray Eames and Edmund Bacon's wife Ruth. Later in 1943, he married Brigitta Valentiner, and moved to California to work for Charles and Ray at the Molded Plywood Division of the Evans Product Company. He worked for them until the war ended in September 1945. In 1950, he moved to Pennsylvania, to establish a studio, and to work with Hans and Florence Knoll. (Florence was also a Cranbrook Graduate). 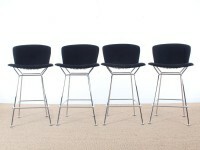 During this period he designed five wire pieces that became known as the Bertoia Collection for Knoll. Among them the famous 'Diamond chair' a fluid, sculptural form made from a molded lattice work of welded steel. They were produced with varying degrees of upholstery over their light grid-work, and they were handmade because a suitable mass production process could not be found. Unfortunately, the chair edge utilized two thin wires welded on either side of the mesh seat. This design had been granted a patent to the Eames for the wire chair produced by Herman Miller. Herman Miller eventually won and Bertoia & Knoll redesigned the seat edge, using a thicker, single wire, and grinding down the edge of the seat wires at a smooth angle - the same way the chairs are produced today. Nonetheless, the commercial success enjoyed by Bertoia's diamond chair was immediate. In the mid-50's the chairs being produced by Knoll sold so well, that the lump sum arrangement allowed him to devote himself exclusively to sculpture. In 1957 he was a fellow at the Graham Foundation in Chicago. The sculptural work that he produced on his own explored the ways in which metal could be manipulated to produce sound. By stretching and bending the metal, he made it respond to wind or to touch, creating different tones. He performed with the pieces in a number of concerts and even produced a series of ten albums, all entitled "Sonambient", of the music made by his art, manipulated by his hands along with the elements of nature. In the late 1990s, his daughter found a large collection of NM condition original albums stored away in one of the barns that he used as studio space on his property in Pennsylvania. Bertoia was the sculptor commissioned to create the Marshall University fountain in Huntington, West Virginia, to honor the university's football team in the wake of the plane crash that killed them on November 14, 1970. For more information on the disaster, see Marshall University air disaster. The 1954 Gordon Bunshaft building for Manufacturer's Hanover Trust-now JPMorgan Chase (510 Fifth Ave at West 43rd Street, New York City) included a full building-width, second-floor screen-sculpture by Bertoia. It was dismantled and removed in 2010 by J. P. Morgan Chase. The 'Golden Sun' was commissioned in 1967 for The Whiting, an auditorium in Flint, Michigan. Seven feet in diameter, the spherical sculpture consists of 675 gold-plated stainless steel branches and hangs in the building's lobby.